The new W124 model, like its W123 predecessor, wasn’t just another car, but a car that became the measuring stick for all other mid-sized sedans of its day. When a company builds a premium product, beloved by its customers, who often take design changes and ‘improvements’ personally, wholesale replacement of an older model is like walking a tight rope. Mercedes-Benz engineers walked that tight rope when it came time to replace the W123 chassis mid-sized sedan that was produced between 1976 and 1985 with an all new model, the Mercedes W124 300 Class that would eventually become known as the Mercedes-Benz E Class. The new W124 model, like its W123 predecessor, wasn’t just another car, but a car that became the measuring stick for all other mid-sized sedans of its day. It was the choice for thousands of taxi drivers across Europe and successful professionals around the world, both groups of very hard to please people. The exterior design is credited to Joseph Gallitzendörfer and Peter Pfeiffer, members of the W124 design team headed by Bruno Sacco. The Mercedes W124 chassis “300 Class” mid-sized sedan became available in the United States in mid 1985 as a 1986 model. Reaction to the new car was swift. In early 1986 Road & Track magazine described the W124 as “New, fast comfortable and maybe the best 4-door sedan in the world.” It seems Mercedes accomplished their mission of creating another ‘measuring stick’ against which other sedans would be measured. The 1986 300 E (Photo: Daimler Media, from the 1986 300 Class U.S. dealer brochure). While European buyers were offered a number of 4 and 6 cylinder engine options in the W124 sedan, the U.S. introduction of the new 300 Class included just two models, the 300 E and the 300 D Turbo diesel. They were identical cars except for their drivetrains, the diesel was 80 pounds heavier than the sedan and weighed in at 3,375 pounds. 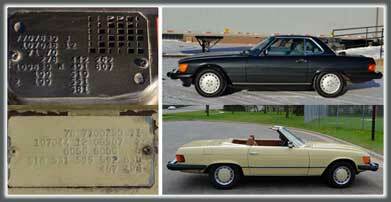 Both models were available with a 4 speed automatic transmission, the 300 E was available with a 5 speed manual. The manual transmission was rarely chosen over the automatic by U.S. buyers, as a result, manual transmission cars are rare today. Interestingly, there was no price difference between the two transmission options. “Arguably one of the most civilized and functionally efficient driving environments extant.” Is how the Mercedes W124 300 E interior was described in the 1987 U.S. dealer brochure (Photo: Daimler Media). The new W124 sedan incorporated a long list of innovative features upon its introduction in 1986 making owner’s lives easier and more comfortable, but there were a number of body style and exterior design innovations that broke new ground. The new car incorporated a trapezoidal shaped rear trunk that tapered in and down from the tail lights placing the trunk lip just a few inches above the rear bumper making loading easier than in the previous generation W123 sedans. Almost every passenger car today incorporates this design feature. The trunk edges, and where the trunk met the rear fenders, was heavily rounded improving aerodynamics. A drag coefficient of .31 was achieved as a result of this design detail, improving efficiency and fuel mileage over earlier W123 cars. A feature that people still enjoy when they see a now ‘classic’ W124 is the single windshield wiper. It’s what Mercedes called an “eccentric-sweep panoramic windscreen wiper”. The single wiper mechanism added linear travel to the rotational movement of the wiper blade to achieve a sweep across 86% of the windshield, at the time, the largest swept area of any car in the world. Heated windshield washer nozzles were also standard equipment on the new car. Multilink rear suspension was replaced with hydropneumatic load levelers in the wagon (Photo: Damiler Media – from the 1987 300 Class U.S. dealer brochure). The 1987 model year marked the introduction of several new 300 Class models for the U.S. market. In addition to the 300 E and 300 D sedans a smaller gasoline engine was offered in the sedan that became the 260 E while the first W124 station wagon was introduced. In 1987 the wagon, referred to internally as the S124, was only available with a turbo charged diesel engine as the 300 TD Turbo. 300 TE wagon self -leveling suspension diagram from the 1988 U.S dealer brochure (courtesy Daimler Media). The 1980s may have been the glory days of Mercedes dealer brochures. They were printed on high quality paper stock, consisted of many pages and had tons of photos, diagrams and cut-away drawings. All parts of the car were explained in great detail, not something you find in many dealer brochures today. 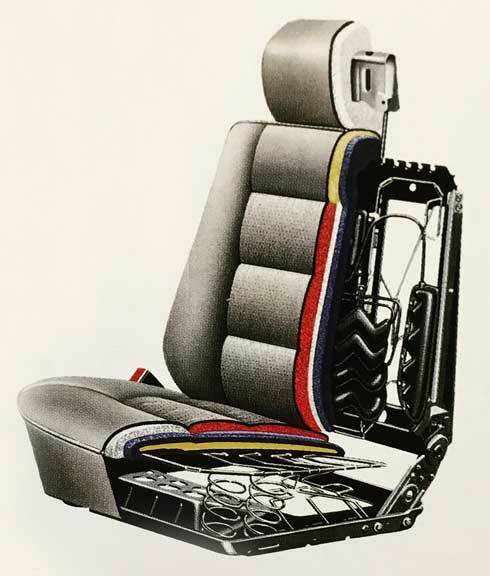 In the Mercedes-Benz 300 Class you didn’t have a seat, you had an ‘Orthopedically designed biomechanical support system’ (Daimler Media diagram, from the 1986 300 Class U.S. dealer brochure). In 1988 the wagon was offered with the same inline 6 cylinder gasoline engine as the 300 E sedan as the 300 TE. Instead of the multi-link independent rear suspension found in the 300 E sedans, the new wagons received a self-leveling hydropneumatic system as standard equipment. The first iteration of Mercedes’, now well known, 4matic all-wheel-drive system was introduced across the range of 300 Class variants in the early 1990s, first available in the 300 TE and TD Wagons in the U.S. The first facelift of the W124 series came to the U.S. market in 1990. 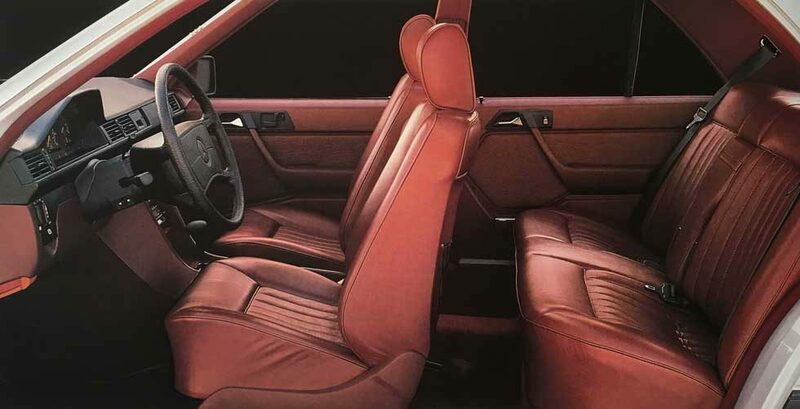 The interior was refreshed with a new seat design and upholstery pattern, changes to the exterior were limited, but quite visible with the addition of protective cladding on the lower part of the doors and fenders with sill paneling in contrasting color to the rest of the body. This feature was first introduced on coupe models when they were first released and trickled down to the rest of the W124 cars and to the rest of the Mercedes-Benz model line as the 90s progressed. By 1992 the 400 E was available for the U.S. market, the first W124 sedan with a V8, but not the last. The 500 E, high performance in a subtle package. Fender flares and integrated fog lights are the easiest way to tell it apart from a standard 6 cylinder W124 (Photo: Daimler Media). 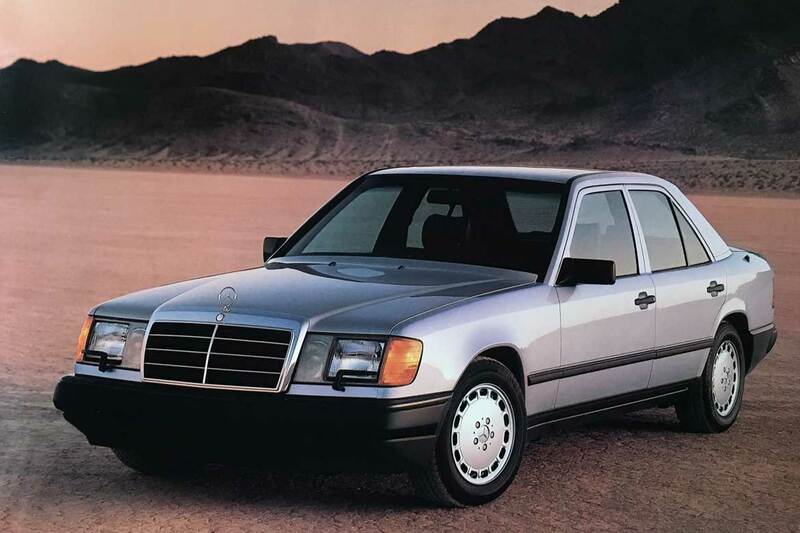 The 500 E is one of the most revered Mercedes of the past 30 years and certainly deserves an entire profile story of its own (which we will provide here eventually – the purpose of this brief summary is to simply touch on its finer points and to summarize the car as it fits into the context of the larger W124 story). Jaws were left on the floor when Mercedes unveiled a high performance variant of the W124 sedan at the 1990 Paris Motor Show, the 500 E. First available in the United States as a 1992 model the 500 E had a sticker price of $80,000, almost $30,000 more than a 300 E. Mercedes looked to Porsche to help with the assembly of the new ‘sleeper’. The basic 300 E chassis was the starting point. It was strengthened to accommodate the higher torque and 315 horsepower output of the 5.0 liter V8 under the hood. It received a slightly wider track with wider wheels and tires that required subtly flared fenders. 0-60 mph time of the 500 E was just 6.3 seconds versus the 8.0 seconds of the 300 E and almost a second faster than the standard V8 of the line, the 400 E that traveled 0-60 mph in 7.1 seconds. In 1994 the 300 Class officially became the E class. 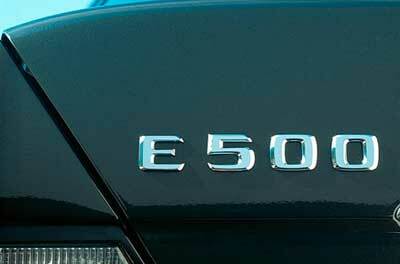 Mercedes changed their naming convention across the model line to incorporate a letter followed by numbers, generally denoting engine displacement in liters. The 1994 model year marked the introduction of a completely new naming convention for all Mercedes-Benz models. Letters came before numbers on the back of the cars and the various classes were standardized with letters. 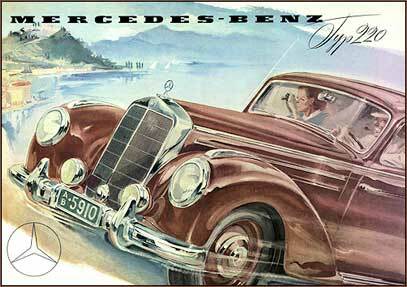 What had been called the ‘300 Class’ since its introduction in 1986 was now the “E Class”. The C Class replaced the ‘190 Class’ and so on down the line. The final iteration of the W124 Sedans were mildly facelifted for the 1994 model year as well. The E 420 replaced the 400 E as the standard V8 powered W124 sedan while the 300 E was replaced by the E 320 powered by a larger 3.2 liter inline 6 cylinder engine. We will discuss coupe and convertible variants in another article here at Mercedes-Market, but their evolution mirrored the sedans for the most part, yet they were only ever available with 6 cylinder engines in the U.S. 1995 was the final year for the W124 sedan. It had a good run, but it was time to step aside for something newer, the next generation E class. 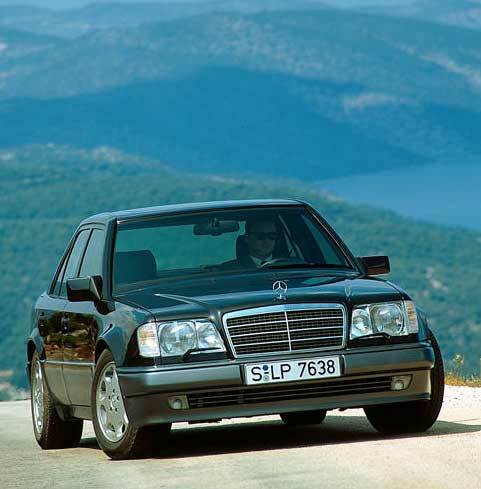 In 1996 the W210 E class was introduced in the United States and once again, the newest mid-sized sedan from Mercedes-Benz made waves across the automotive world with a front end design with 4 head lights as its most unique characteristic. In total, there were 2,737,860 W124 based cars built for the worldwide market, across all body styles. That was a new production record for a single Mercedes-Benz chassis, by more than 40,000 units over the previous record holder, the W124’s predecessor, the W123. There were just over 2.2 million sedans, about 340,000 station wagons, a little more than 141,000coupes and almost 34,000 convertibles. There were even a few thousand limousines built based on the W124 and several thousand chassis provided to various companies for specialty bodies, like ambulances and hearses. Sedans of any kind rarely become true collectibles worth a lot of money, but like many Mercedes sedans over the past 50 years they are often preserved as objects of affection by their owners. With an enthusiast following, a beloved model can thrive long after what is thought to be its useful life. This is the case with many W124 cars. Maybe it’s the aspirational nature of the Mercedes-Benz brand, timeless design or the quality of the engineering that keeps so many older Mercedes on the road, even the seemingly pedestrian sedans. It’s probably a combination of the three, but it’s why you can still see the occasional 300 E as someone’s everyday transportation 25 years after the last one was produced. This St. Paul, MN based Mercedes enthusiast participated in the 2017 Walleye 1000 Vintage Rally in his pristine, original W124 300 E despite the fact that he has a Porsche 911 and Mercedes W113 Pagoda SL in his garage as well. Among W124 sedans the 500 E / E 500 models have the best potential as true collectibles in the future as we’ve already started to see exceptional examples sell for more than they cost new (ignoring inflation). There is a good chance the W124 series will mirror their predecessor, the W123, in terms of the collector car market, so don’t rule out the wagons as good bets for future collectability. With such high production numbers the future collectability (and value) of W124s will be determined by condition. Perfect, original, time capsule survivors will be worth the most money, but they will be few and far between. 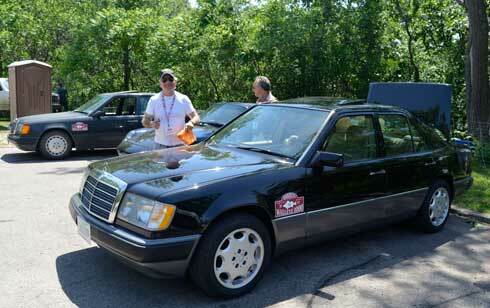 The second tier of collectible W124s will be the more numerous, but still not common, ‘preservation class’ example. Those cars that have been regularly driven and maintained over their lifetime yet remain in good, preserved, original condition. The emergence of the ‘Silver Star Preservation Class’ at Mercedes-Benz Club of America events helps give people a reason to maintain cars such as these and should help the survival rate long term. Our advice, find a W124 that you love, for whatever reason, buy it, maintain it, drive it. They’re well engineered cars, built like tanks and they’ll provide you with many comfortable miles in style if you take care of them.